A new Freakonomics-style book called Scorecasting takes a statistical look at common myths and perceptions in sports. One of these is the case of home field advantage. In their work, they claim that most of home field advantage is the result of favorable officiating. While I don't dispute this, and tend to agree with the general premise, they go on to argue that home plate umpiring is a significant component of home field advantage in baseball. This is just plain wrong, and the people who do this work with some frequency (including myself, but also fellow sabremetricians such as Dan Turkenkopf, Mike Fast and Phil Birnbaum) know that it's wrong. How do we know? Because we've already crunched the numbers and found them practically insignificant. I assigned a run value to each "blown" call thrown during the regular season from 2008-2010... I find the home vs. away spread to be -0.119, or about +/- 0.06 runs, per 150 called pitches (equivalent to the average nine-inning game)... 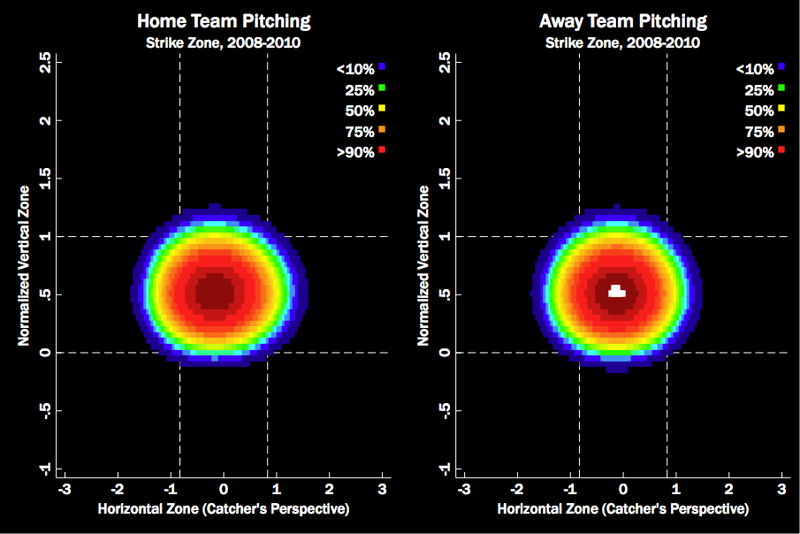 Considering that the run environment over this period is about 9.1 per game... home team bias in the strike zone only accounts for ~16% of the observed effect... For those of you scoring at home, that advantage is equivalent to playing an entire season at home and barely winning one extra game.